Eyes by ToGoSpa - Green Tea Eyes ~ $15.00 for 3 sets. Green Tea Eyes - The Energy Drink For Your Face. Taurine and Green Tea Extract promote circulation for that extra tingly stimulation. Excellent for dark circles. 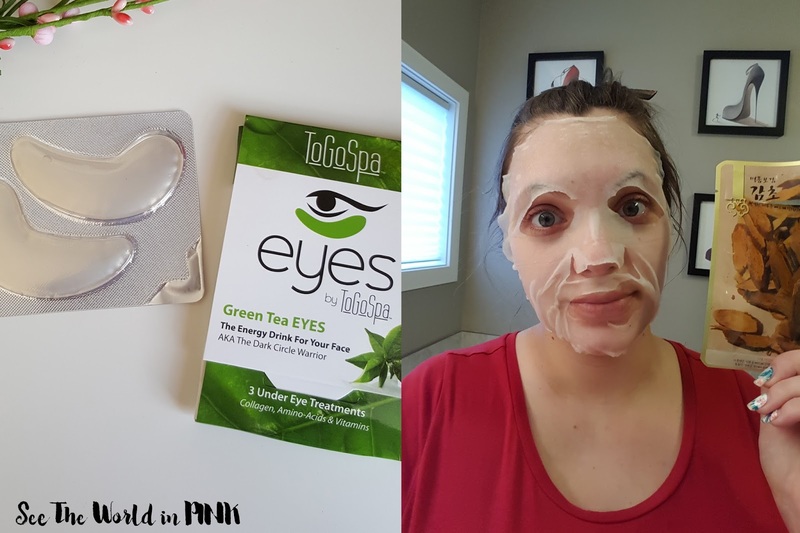 I love these eye masks - they work so well and really pepped up my under eyes and really improved my dark circles! Love! I did a full Mask Wednesday post on these masks and you can read my full thoughts here! Evercos Herbal Mask "Licorice" ~ 10,500 Won for 5 ($8.93 USD for 5) = $1.79 USD per mask. For keeping your skin bright and moist forever. These masks are much harder to find than the traditional k-beauty sheet masks! I quite like them -I reviewed this quite a while ago and you can check it out here - it lasted for over 30 minutes on my face. The fit was a bit too big and it didn't spread out well, but it did adhere pretty good and made my skin look good! The smell is a little medicinal, but not too bad! Leaders Mediu Amino Pore-Tight Mask ~ $2.94 (10 masks for $29.39). Tightening & Firming + Amino acid. Amino acid complex with proline, tea tree leaf oil, zinc PCA. I got this quite a while ago in a past Mask Genie pouch and never used it - I had to use it as it was almost expired. This is meant for oily skin (which can be too drying usually on my dry skin), so I didn't wear it for too long. It did have tea tree so I thought it would help with some hormonal acne. This worked okay, but was drying. Lush Rosy Cheeks ~ $12.95. Find the happiness you seek by cleansing cheek to cheek with this gorgeously soothing fresh mask. A simple blend of kaolin, calamine and Turkish rose oil delicately calms the skin and restores balance. Whether you're feeling hot and bothered or just love showering your complexion with roses, cleansing calamine and kaolin will gently remove dirt while exquisite rose oil nourishes and tones your face. Calm, matte skin, here you come! This mask smells really good, like roses! I was planning on reviewing this mask and did not get around to it, but I really liked it! Rose works so well on my skin - it is so calming! I found this to be a little drying, so I started using a serum prior to applying the mask! Sisley Paris Black Rose Cream Mask ~ full size is $225.00 (this is a sample size). The Sisley Black Rose Cream Mask offers the skin an instant youth effect. Rich in active anti-aging ingredients (Black Rose, Padina Pavonica and Alkekengi Calyx Extracts), it immediately gets to work on signs of fatigue and leaves the skin looking youthful and energized. It brings together three actions to restore a luminous complexion and re-densified skin in just 10 to 15 minutes: smoothing and plumping action, revitalizing, and softening and hydrating. Deliciously scented with Rose, this soft, creamy mask creates a moment of relaxation and pleasure. This mask is a leave on mask - apply this and leave on for 10 to 15 minutes and wipe off any excess. This can also be used as an intensive overnight mask by leaving a generous layer on the skin overnight! This mask is so soft and soothing and smelled so good! This left my skin feeling supple and refreshed and I really liked this! Repurchase: Ugh, it is damn expensive! 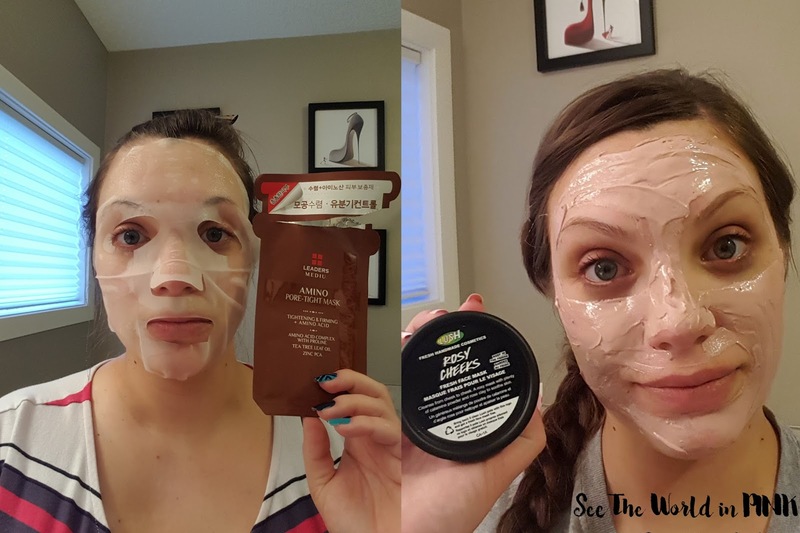 I love Mediheal masks - it's one of my favorite overall mask brands! 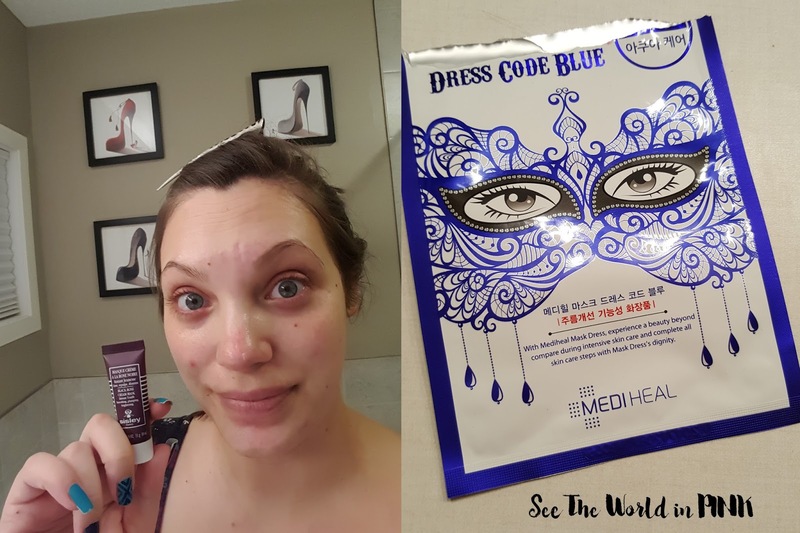 This blue dress code mask not only looks great on, but it seriously delivers a great punch of hydration for the skin! I did actually write a full review here on this mask! It is so hydrating and so soothing and moisturizing on the skin! Love! This made my Monthly Favorites in March of this year! Lush Cup O' Coffee Face And Body Mask ~ $19.99 for 325g (also, $10.95 for 150g). 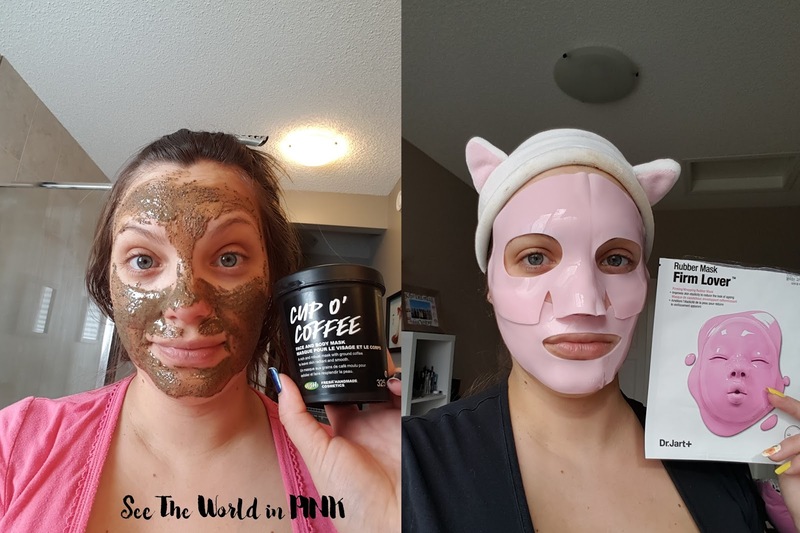 If you're a sucker for the strong, scrubby, stimulating type, this coffee-filled mask is just the thing to kick-start your day. Wake up and invigorate your skin and mind with the rich, intoxicating aroma of freshly brewed coffee and sweet roasted cocoa extract. Kaolin deeply cleanses impurities from the pores and ground coffee acts as a gentle scrub to buff away dryness and reveal glowing skin beneath. Smooth this one all over your body to feel soft, clean and wonderfully fragrant. This is a great mask - it is for face and body! The best way to use it is apply it a few minutes before you get in the shower and then scrub it in and rinse off. It is made with actual coffee and coffee beans so it smells super strong and is such a good perk up in the morning! 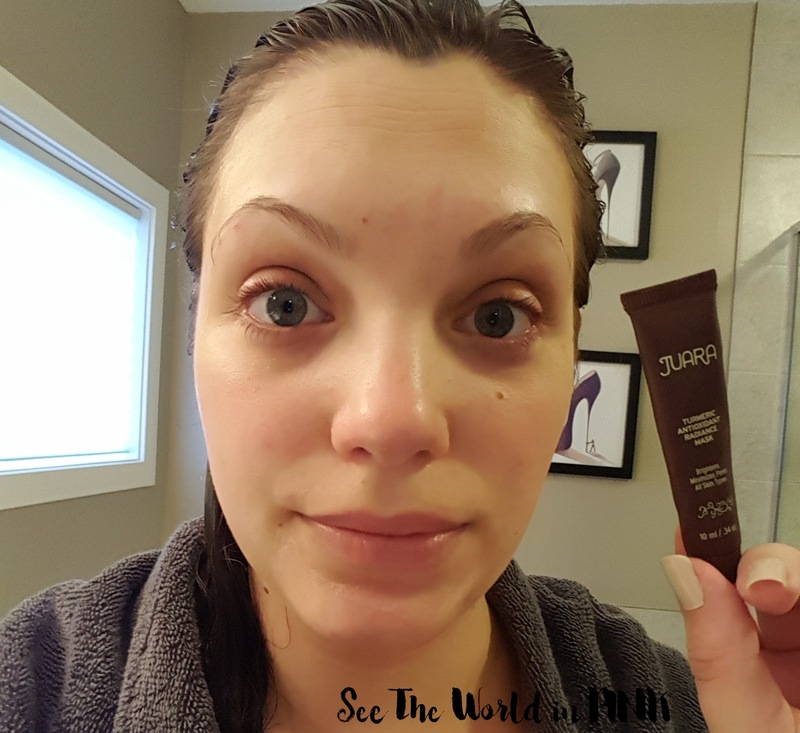 You can check out my full review on this mask here, and it made my Monthly Favorites in April of this year! Dr. Jart+ Firm Lover Rubber Mask ~ $17.00 CAN. A firming two-step rubber mask that delivers actives into the skin while providing cooling benefits for a visibly more defined and contoured complexion. This is a 2 step mask - you can see all the steps on the Mask Wednesday review post I did here! This mask fit surprisingly well and lasted for over 40 minutes! The first step was a little too thick and overall this left my face feeling greasy. Also, it's $17 so that's crazy! 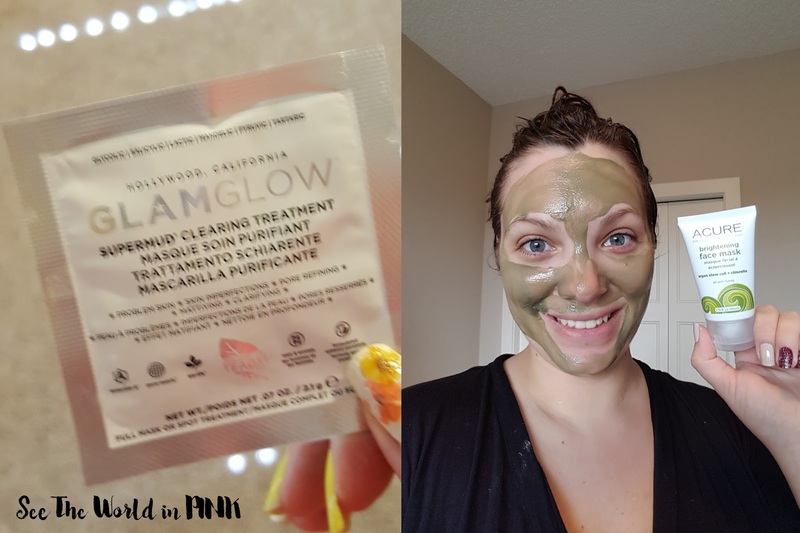 Glamglow Supermud Clearing Treatment ~ sample size (full size is $24.00 to $79.00). A skincare mask designed to visibly clear the complexion. My skin was dying for any acne treatment this whole - it was breaking out so bad (I'm going to blame it on hormonal acne post baby!) I thought this went on really well, smelled good, was quick to use, and worked well on my skin! Repurchase: Yes, would like to try this again! 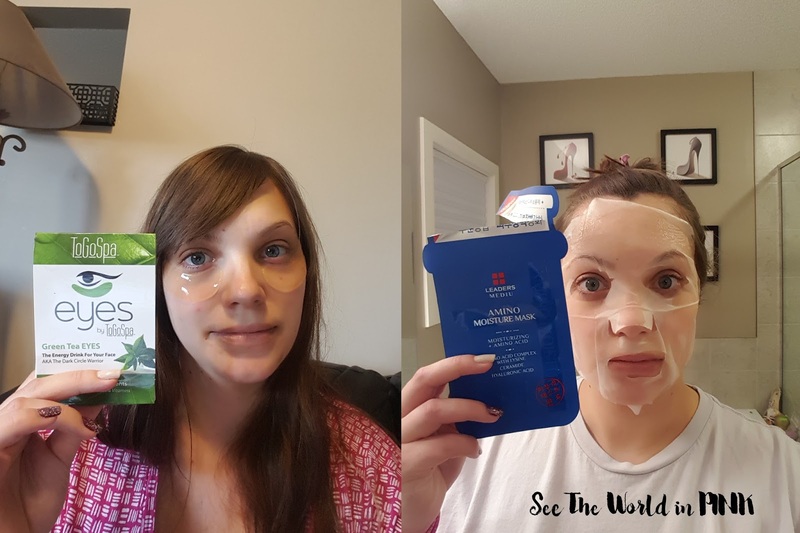 Acure Organics Brightening Face Mask ~ $9.99 US (also, $13.99 CAN on well.ca) Brighten up your day with the power of Moroccan argan extract and chlorella, a true synergy of rejuvenation. French green clay has a drawing effect and Moroccan argan oil and CoQ10 provide moisture. I love Acure branding and products - this says to apply until you look like a green sea monster! I featured this on a Mask Wednesday post and you can check out my thoughts here! It was a bit hard to rinse off, but this mask made my skin look and feel amazing! Repurchase: Yes, but I still have the whole tube to use! Repeat from earlier this month! Yes I love them! LEADERS - Mediu Amino Mask "Moisture Mask" ~ $6.86. Brightening and Lifting effect. Offers deep hydration and nutrients to your skin. This mask smelled so weird - like one of those wet wipes you get with an order of messy chicken wings... so hard to wear! This did make my skin feel really moisturized, but also incredibly sticky! I didn't like that. Juara Skincare Turmeric Antioxidant Radiance Facial Mask ~ sample (full size is $38). Discover the the proven antioxidant power of Turmeric to detoxify, brighten and bring life to stressed, tired, dull-looking skin in one single step. A unique combination of Turmeric, Kaolin Clay and Candlenut Oil leaves skin glowing, refreshed and more refined. Repurchase: Yes I really want to! So for May I used 13 masks - I prefer a little bit more, but my time for skincare has gotten significantly shorter since the babies arrival! Once we get a bit more of a routine going I will hopefully use a few more masks!